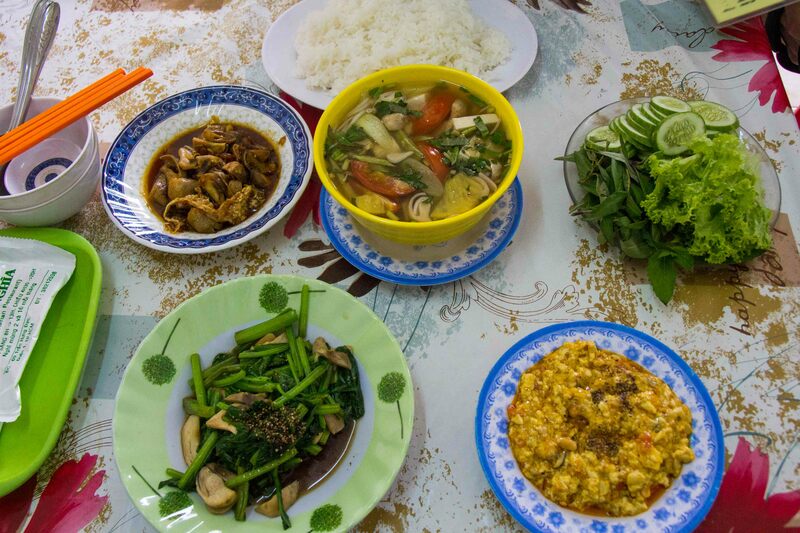 On this episode of Christina’s “Street Feast” series, Christina’s team member Tram highlights vegetarianism in Saigon. Tin Nghia is rooted in the history of Saigon, an establishment whose longevity speaks to its popularity. 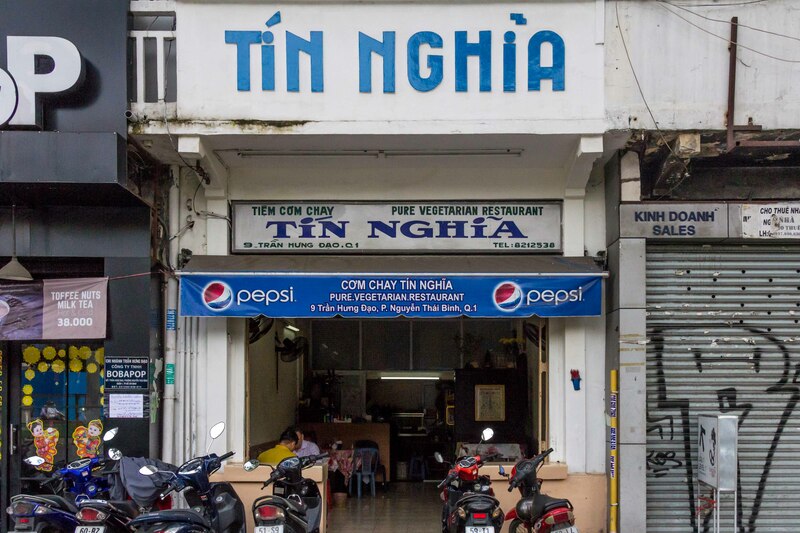 Sitting only a stone’s throw away from the well-known Cho Ben Thanh, or Ben Thanh Market, for over a century, this one-room shop has watched the fall and rise of Ho Chi Minh City. Today, the view from the shop is one obstructed by barricades due to the city’s first subway line to be completed in 2020. 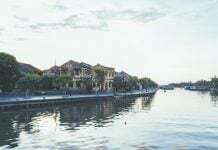 The guests are comprised of both regular diners and guests from all corners of the world who stumble upon the space after a long day of touring Saigon’s many attractions. For a restaurant of such high esteem, the storefront is quite modest. A door-less rectangular archway with the restaurant’s name in blue block letters is the only indicator of the restaurant’s existence. It is easily sidestepped if you aren’t paying attention. The store has remained in the ownership of one family who asked to remain anonymous in this publication. Spanning three generations, the current proprietors still subscribe to the statutes of their Cao Dai faith, including vegetarianism and ancestor worship. The store space is almost bare save for ancient scrolls promoting good luck and two altars to the deceased. A trio of grannies past their more formidable years man the operations but are bursting with a sprightliness that would say otherwise of their age. Maybe it’s all that vegetarian food keeping them lively. In any case, I’m sold. Two of the three can be seen working diligently in a seriously pristine kitchen, honestly the cleanest kitchen I’ve seen in any restaurant thus far, while the other, a gentle creature with the sweetest disposition, manages the front end operations. A vegan meal can be very yummy and nutritious, do you know that?! The city’s foodscape is notoriously competitive, yet this restaurant, if it can even be called that, has managed to outlast much newer prospects. In actuality, it is more like a canteen than a full-blown restaurant –very homely and soft-spoken, preserving the aesthetics of a traditional Vietnamese eatery than the modern crop of design-focused stores. Candy colored plastic chairs wrap around metal tables covered in flowery vinyl tablecloths. There are only six tables in the whole restaurant and everyone is seated fairly close to one another, although there is much more space at Tin Nghia than your average street food affair. And don’t miss spring rolls! The menu is impressive. Forty items more impressive than other restaurants to be exact. It is common for most street food restaurants to feature less than five dishes so to have this many options is somewhat astounding. The menu is also featured in English and Chinese, taking out the guessing game when it comes to ordering that is endemic of most street food haunts. Have you tried vegan fish sauces? Tin Nghia advertises itself as a pure vegetarian restaurant, which in actuality means it’s a vegan restaurant. To take out the confusion, it means NO ANIMALS WERE HARMED IN THE MAKING OF THIS FOOD. According to my guide Tram, even the fish sauce is vegan! How magical is that? FYI – despite the fact that Saigon is among the top ranking destinations for vegetarians in the world, fish sauce is the bane of a vegan diet here in Vietnam. The restaurant is open every day from 7:30 a.m. to 1 p.m. and 4:30 p.m. to 7:30 p.m., but is closed on the 2nd and 16th day of the lunar calendar every month. This seemingly offbeat routine is due to the fact that many Buddhists in Vietnam observe vegetarianism on the 1st and 15th day of the lunar calendar each month and so, the restaurant owners close shop in order to rest after a hectic day of serving the days before. There is even a special menu on the 1st and the 15th. 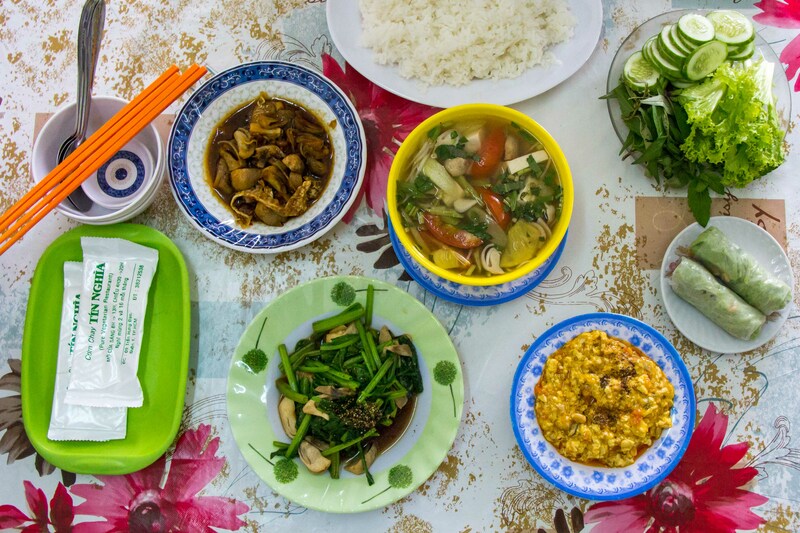 This restaurant is also praised because it is one of the few vegetarian establishments in Ho Chi Minh City that doesn’t resort to using fake meat. The umami is 100% real. Tram ordered up our lunch Vietnamese-style, which includes a starter, a few main dishes, a large mound of rice, and a soup dish. Our starter was a serving of fresh spring rolls, followed by two mushroom dishes, salted tofu (a specialty), and a sweet and sour soup. Number 25 on the menu, mushrooms cooked with black soy beans and deep-fried tofu skin, was the standout performer hands down. I was lapping up all the remaining sauce with my white rice. The most memorable dish however, was the salted tofu, the item Tram was looking most forward to because of its rave reviews. What looked like pureed scrambled eggs happened to be a bowl of fermented tofu, with a pungent taste that deters even the bravest of souls. Even though I am a fan of sour flavors, I willingly abstained from eating too much because it was just too powerful a flavor. If you are an adventurous eater, this is essential. Otherwise, stick to the basics. Tram filled me in on the fact that none of these recipes have been recorded; they are all whipped up from memory. Albeit the lack of exact measurements, the taste remains consistent across the board day in and day out. And going vegan can make you more beautiful, believe me? For vegetarians/vegan travelers, this stop is a no-brainer. 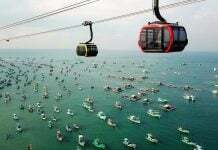 Located in downtown Saigon on a main street, it’s not obnoxiously difficult to find. Vegetarian food is quite easy to come by so long as you are versed in this one word, chay. Chay, meaning vegetarian in Vietnamese, is a fixture on all restaurant signage and can be used to transform a meat dish into a vegetarian one when used as a suffix. For example, you can say “Can I have banh mi chay?,” meaning “Can I have a vegetarian banh mi?” Most restaurants are willing to accommodate but be careful when ordering pho chay (vegetarian pho) as most broths are made out of animal bones, unless you’re eating at a strictly vegetarian restaurant. 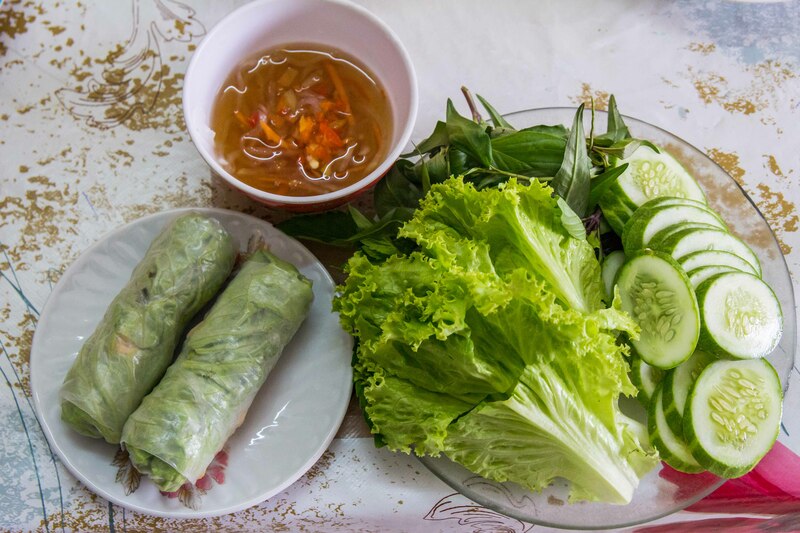 If you would like to learn more about the vegetarian offerings in Saigon, check out our “Going Vegetarian in Saigon” guide. Opening time: From 7:30 a.m. to 1 p.m. and 4:30 p.m. to 7:30 p.m.
Let us know how your vegetarian adventure went in the comments!